Icons contribute to the beauty of worship. They are like windows open on the realities of the Kingdom of God, making them present in our prayer on earth. Although icons are images, they are not simply illustrations or decorations. They are symbols of the incarnation, a presence which offers to the eyes the spiritual message that the Word addresses to the ears. 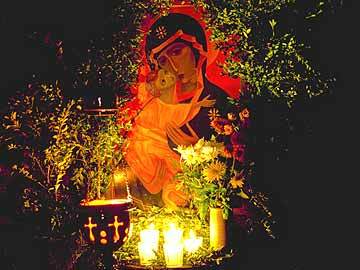 According to the eighth-century theologian Saint John Damascene, icons are based on the coming of Christ to earth. Our salvation is linked to the incarnation of the divine Word, and therefore to matter: “In the past, the incorporeal and invisible God was never represented. But now that God has been manifested in the flesh and has dwelt among men, I represent the visible in God. I do not adore matter; I adore the creator of matter, who has become matter for my sake, who chose to dwell within matter and who, through matter, has caused my salvation” (Discourse I,16). By the faith it expresses, by its beauty and its depth, an icon can create a space of peace and sustain an expectant waiting. It invites us to welcome salvation even in the flesh and in creation. 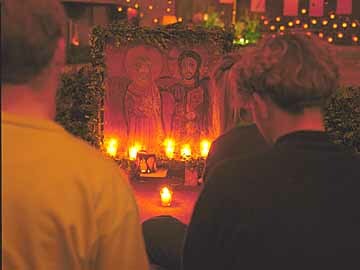 The icon of the Virgin Mary in the Church of Reconciliation, Taizé.